How do I Create a Work Order? The Work Orders (WO) application allows you to easily manage and dispatch resources to address customer problems on-site. It also provides a method for employees to track the hours & products used to resolve each work order. Let's create a Work Order. Log in and access Work orders app from your universal navigation menu bar. 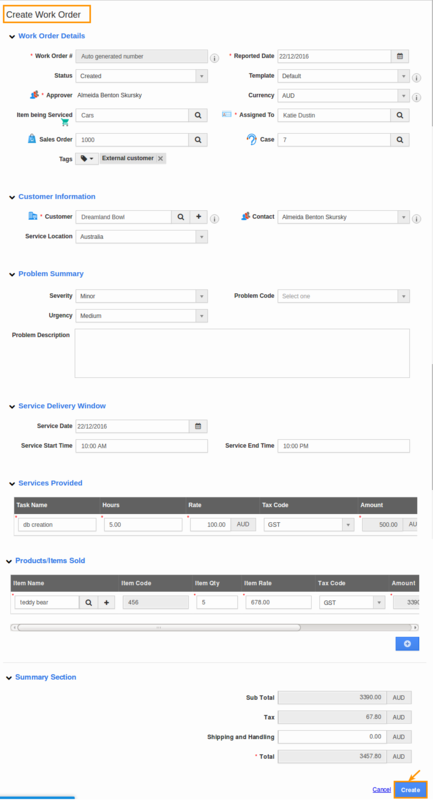 Select whether to create work order for items or services or both. Customer - Select customer by search. Sales order Approver - Select sales order approver. Work Order # - Work order number. Item Being Serviced - Include items to be serviced. Case Assigned To - Case assigned to employee. Reported Date - Problem reported date. Status - Status of the work order. Template - Template to be included in work order. Service Location - Customer's location (Country, state). Problem Summary - Provide summary of the problem. Service Delivery Window - Service date, start and end time. Services Provided - Specify provided services to customer. Product/Item Sold - Search product/item to be sold to customer.